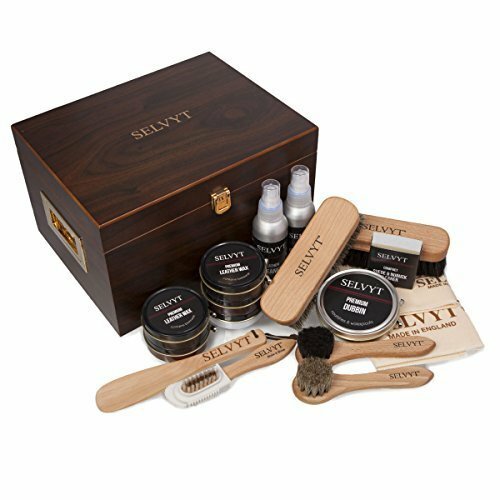 A full shoe care kit from Selvyt includes, 2 horsehair buffing brushes, 2 horsehair applicator brushes, wax polish in black, neutral, tan, dark brown, medium brown. 1 tin of dubbin. leather cleaner and protector. 1 selvyt sr a cloth and 1 selvyt sr b cloth. a suede brush and a selvyt nubuck and suede rubber and a 19cm wooden shoe horn to compliment a full luxury shoe care kit. wax polish in black, neutral, tan, dark brown, medium brown. 1 tin of dubbin. a suede brush and a selvyt nubuck and suede rubber and a 19cm wooden shoe horn to compliment a full luxury shoe care kit. If you have any questions about this product by Selvyt, contact us by completing and submitting the form below. If you are looking for a specif part number, please include it with your message.